Hornets are large, social wasps who use sharp stingers and powerful venom to capture prey and to defend themselves. Unlike honeybees, which can sting only once before dying, hornets and their close relatives can deliver multiple stings in quick succession. While they are beneficial predators of many pest species, hornets are potentially dangerous insects; some species have caused human fatalities. Technically, the term hornet or "true hornet" applies only to wasps of genus Vespa. However, the term “bald-faced hornets" refers to aerial yellow jackets of genus Dolichovespula, which causes some confusion. Both true hornets and their bald-faced relatives share many similarities -- both build and vigorously defend large, papery nests built high off the ground. 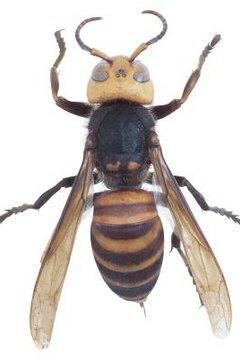 Several bald-faced hornets are native to North America, but the only true hornet living in North America is the non-native European hornet (Vespa crabro). The stingers found in hornets, yellow jackets and their kin are highly modified ovipositors that their ancestors used for depositing eggs. Their colonial social structure means that only the queens need ovipositors, so the ovipositors of workers have evolved into stingers. Because the stingers are derived from ovipositors, males wasps and bees lack stingers. Hornet stingers are smooth, sharp and connected to venom sacs inside their abdomens. Lacking barbs, hornet stingers enter and exit flesh easily, allowing the creatures to sting repeatedly. Like true hornets, the vast majority of wasps have smooth stingers, which gives them the ability to sting repeatedly. By contrast, honeybees (Apis spp.) have barbed stingers that ensnare the flesh of the predator, causing the entire structure -- including the venom gland -- to rip out of the bees when they pull away after stinging. The stingers and venom glands connect to their digestive systems; when the bees attempt to fly away, the stingers remain behind, pulling part of their digestive systems out with them. This causes the bees to die soon after using their stingers. While most hornets, wasps and yellow jackets have smooth stingers, University of Tennessee associate professor of Entomology and Plant Pathology John A. Skinner discovered that individuals of one yellow jacket species differ from the rest: Female Vespula flavopilosas, a hybrid species, carry barbed stingers. Because they can remain in the skin of people who have been stung, they may be confused with honeybee stingers. The largest hornet species, the Asian giant hornet (Vespa mandarinia), is dangerous to humans. In 2013 alone, more than 40 people have died from hornet stings in China, with Asian giant hornets being the prime suspects. Additionally, Japan reports an average of 30 to 50 deaths each year from the giant hornets. While most fatalities occur due to an allergic reaction to the hornets' venom, the venom is potent even in victims who aren't allergic, often causing kidney damage and the destruction of red blood cells. Earth and Sky: Why Do Honeybees Die After They Sting You?